The first-ever study to map U.S. wild bees suggests they are disappearing in the country’s most important farmlands—from California’s Central Valley to the Midwest’s corn belt and the Mississippi River valley. 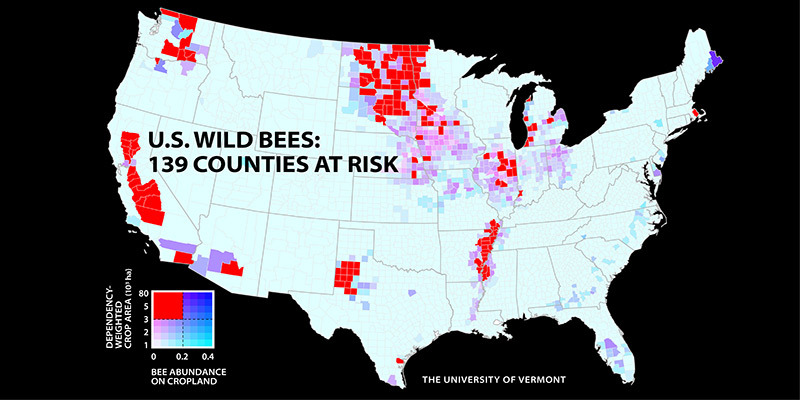 A UVM study of wild bees identifies 139 counties in key agricultural regions of California, the Pacific Northwest, the Midwest, west Texas and the Mississippi River valley that face a worrisome mismatch between falling wild bee supply and rising crop pollination demand. The study estimates that wild bee abundance declined in 23 percent of the contiguous U.S from 2008 and 2013. It also shows that 39 percent of U.S. croplands that depend on pollinators—from apple orchards to pumpkin patches—face a threatening mismatch between rising demand for pollination and a falling supply of wild bees. These counties tend to be places that grow specialty crops—like almonds, blueberries and apples—that are highly dependent on pollinators. Or they are counties that grow less dependent crops—like soybeans, canola and cotton—in very large quantities. Of particular concern, some crops most dependent on pollinators—including pumpkins, watermelons, pears, peaches, plums, apples and blueberries—appeared to have the strongest pollination mismatch, growing in areas with dropping wild bee supply and increasing in pollination demand. Pesticides, climate change and diseases threaten wild bees—but their decline may be caused by the conversion of bee habitat into cropland, the study suggests. Over the last decade, honeybee keepers facing colony losses have struggled with rising demand for commercial pollination services, pushing up the cost of managed pollinators–and the importance of wild bees. A team of seven researchers—from UVM, Franklin and Marshall College, University of California at Davis, and Michigan State University—created the maps by first identifying 45 land-use types from two federal land databases, including croplands and natural habitats. Then they gathered detailed input from national and state bee experts about the suitability of each land-use type for providing wild bees with nesting and food resources. Learn more about UVM efforts to save global bees. Watch a video on making bee-friendly farms. -Basil Waugh is the communications officer for the UVM Gund Institute, and Joshua Brown is a staff writer for UVM Communications. This piece was first published by the Gund Institute. Oh my goodness! Incredible article dude! Thank you, However I am having troubles with your RSS. I don’t understand why I am unable to subscribe to it. Is there anyone else getting similar RSS problems? Anybody who knows the answer can you kindly respond? Thanx! !